Or, as it's written in Icelandic, Þingvellir. Most of the other Germanic languages gave up on the letters thorn (Þ) and eth (ð) long ago and now use th, but Icelandic still uses them. So for example, you see the name Thor written as Þor. All of which gives me scary flashbacks to Professor Renoir's Old English class and the unpleasant sensation that I'm about to be called on to read and translate a passage from The Wanderer, so I'm going to stick with English spellings from here on. 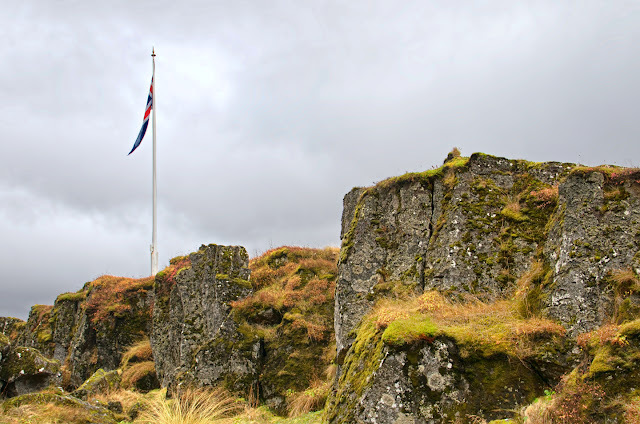 The Althing, the national assembly of Iceland, was established at Thingvellir in 930, only sixty or so years after the first settlers from Scandinavia arrived here. (“Thing” in Icelandic means meeting or assembly; “vellir” means fields.) The meetings continued to be held here until 1798, but now it's just a national park and World Heritage Site.